The United Arab Emirates says it will use robots as jockeys for camel races from next season. The move comes after widespread international criticism of the use of young children to ride camels during the long and often hazardous races. Officials say a prototype of the robot was successfully tested on Saturday. Aid workers say there are up to 40,000 child jockeys working across the Gulf. Many are said to be have been kidnapped and trafficked from South Asia. 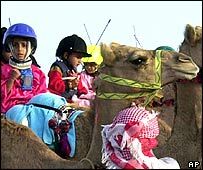 The issue of child camel jockeys has been an embarrassing one for the Emirates, says the BBC's Gulf correspondent Julia Wheeler. Camel racing is one of the UAE's traditional sports and an important part of the region's heritage. One in a series of laws was introduced this month to forbid the use of jockeys under the age of 16 from taking part in the sport. Now it seems there will be no need for the rules to be flouted, our correspondent says. Mechanical light-weight jockeys have been designed for the purpose to be used in the races. "The mechanical jockey is light in weight and receives orders from the instructor via a remote control system fixed on the back of the camel," the daily Gulf News said, quoting an official statement. At a test in the Emirates, members of the royal family of Abu Dhabi said they were impressed. And the idea is likely to be received positively by human rights groups, says our Gulf correspondent. They say several thousand boys, some as young as four, work as jockeys - many after being abducted or sold by their families. They say the boys are kept in terrible prison-like conditions where they are deliberately underfed to keep them light so the camels can run faster.